National University NU Honours Admission Notice 2017-18 has been announced. National University – NU Honors 1st Year Admission notice 2017-18 Online Application start 24 August (Thursday) 2017 and Class will start on 15 October 2017. NU Honors Admission Result 2017-18 www app nu edu bd. National University Honours 1st year Admission online apply 2017. NU honors Admission apply online at www.admission.nu.edu.bd and www app1.nu.edu.bd. How to apply online NU Honours admission 1st year 2017-18? Online application start on 24 August 2017 and deadline will publish soon. NU honors admission result will publish September 2017. There will not any admission test. Merit list and waiting list will make by the GPA of HSC and SSC. Bellow you have to see the nu honours admission notice circular 2017-18 and online application process. NU Honours Admission Notice 2017-18. National University for the academic session 2017-18 of NU Honours Admission 1st Year 2017 Notice has been announced. This year NU Honours Admission Process 2017-18 will be starting on 24th August (Thursday) 2017 & National University for the academic session 2017-18 of Honours 1st Year class will be started on 15th October (Tuesday) 2017. National University for the academic session 2017-2018 of NU Honours admission 1st Year Process will be completed on November 2017. NU Honours admission 1st year release slip application will start on December 2017. All the students who did not get chance, or did not get honours 1st year admission, after merit list, or Admission canceled those students can apply by the Release Slip. For that should go to National University official website www admissions nu edu bd or www nu edu bd/admissions. More details you may find out on the advertisement which we are given bellow. Release Slip application will not submit to any college. Also candidate would not have to pay any application Fee. And no need to verify by the college of this application. 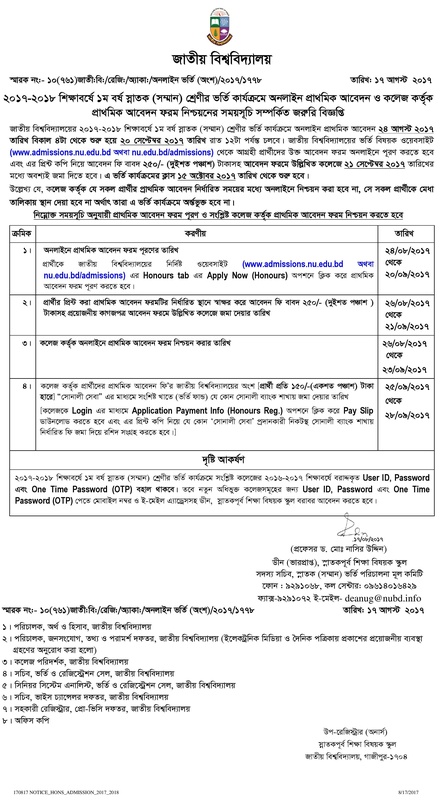 National University – NU Honors admission 1st year Notice 2017-18 at www.nu.edu.bd/admissions. National University Honours 1st year admission online apply and result. NU Honours 1st year merit list. 2nd merit list, 3rd merit list of NU honours admission result 2017-18. Full Notice will publish soon at this page via www nu edu bd/admission. National University is the largest public university of Bangladesh, invites online application from eligible candidates for admission into 4 years bachelor honours programs. Interested candidates have to apply online at National University website www. app nu.edu.bd. NU honours admission 2017 online application will start from August 24, 2017. NU honours 1st year class for the academic session 2017-18 will be started from October 15; 2017. NU Honours Admission Test will not be held for NU 1st Year Admission for the academic. From this year any examination (admission test) will not be taken in National University Admission. NU Honours Admission will depend on interested students’ SSC & HSC results 2017. Based on SSC & HSC results students will get chance to admit National University for the academic session 2017-18 of Honours 1st Year. This year National University NU Honours Admission Process 2017-2018 will be start before on 4 months. In previous years National University Honours Admission Process were started on the month of January & classes were started on the month of March-April. That’s why students were faces session jams. Last 25th May (Monday) 2017 National University 82th academic council was held. In this academic council National University’s Vice-chancellor Dr. Harun-Or-Rashid, National University’s Pro Vice-chancellor Dr. Aslam Bhuiyan & Dr. Munaj Ahmed Nur, National University’s Treasurer Noman-Ur-Rashid & deans of different departments were present. This academic council was formed by different government universities teachers, government & non- government colleges principals & deans. A total member of this academic council is 40. But 33 members were present at National University 82th academic council. This meeting was directed by National University’s Vice-chancellor Dr. Harun-Or-Rashid. “Masters of Advanced Studies in Library and Information Science” named special Masters Degree Program will be started at national University Main Campus Gazipur. This special Masters Degree Program time duration is 1 year & 6 months. Interested students will apply in National University Honours Admission Notice by online. Students will apply in National University NU Honours Admission Notice 2017-18 by National University website at www.nu.edu.bd/admissions & also by our website. Details information about “National University NU Honours Admission Notice 2017-18″ will be found in National University website at www.nu.edu.bd/admissions & also by our website. We know guys; NU Admission Test will not be held for NU 1st Year Admission for the academic. National University is largest university in Bangladesh and it’s established in 1992 by as an affiliating University of Bangladesh. National University’s short from NU; which is located in Gazipur. There are 2,28,645 seats for NU honours admission 1st year and among them Dhaka Mohanagar Division has 43004 seats, Dhaka Division (except Dhaka Mohanagar) 50,595 seats, Barishal Division 13, 325 seats, Chittagong Division 29266 seats, Sylhet Division 7695 seats, Khulna Division 39675 seats and for Rajshahi Division 55,085 seats. Tags: national university admission 2017-18; nu admission. admission nu edu bd; admissions nu edu bd; www admission nu edu bd; nu honours admission 2017-18; app1 nu edu bd; nu honours admission result 2017; Nu edu bd admission; national university admission 2017-18; www nu edu bd/admission; nu admission result; nu edu bd/admissions; www admission nu edu bd com; nu honours admission result 2017-18; www nu edu bd/admissions; nu edu bd/admission; national university admission result 2017-18; www nu edu admission; www nu 3rd merit list 2017-18; NU Honours 1st year 2nd release slip admission result 2017-18; NU Admission Merit list download 2017; www.nu.edu.bd/admissions; NU admission Honours 1st year Merit list; www app1 nu edu bd; NU Honours 1st year waiting list 2017-18; NU Honours admission result 2017-18.